Change is afoot. Here in Shenzhen, we view change as urban villages undergo serious transformations, with tenants evicted to make way for development companies seeking to ‘renew’ these spaces. More notably, you can see change in the way art reacts to this cycle of urban death and rebirth. Guangdong-based artist Huang Cheng turns his focus from exhibitions to audio recordings of daily life in Shenzhen’s urban villages, like Baishizhou. Artistic groups like SJT and Canton Gallery in Guangzhou take their operations into the back alleys, away from the bustling promenades. Certainly, change is happening fast. Craft: The Reset, an exhibition based out of Design Society's Sea World Arts & Culture Center, aims to showcase some of these changes by bringing together designers and artists who are currently working to create pieces that shed light on the value of traditional crafts, making use of such materials as bamboo, porcelain and textiles, among others. Just as any vibrant art scene acts as a reaction to something shocking, jolting or forward-moving, much of China’s recent cultural march forward has been driven by the chaos and confusion caused by the country’s increasingly digitalized society. Design Society’s second-ever main gallery exhibition, Craft: The Reset takes place over the next four months, running until February 19, 2019. Following on from their Minding the Digital exhibition, which sought to show the creativity that blooms within the ongoing tech revolution, Design Society take a step back to examine the effects that these current circumstances have on traditional Chinese crafts. What we learn at the exhibit is that significant crafts and materials in China are transforming. 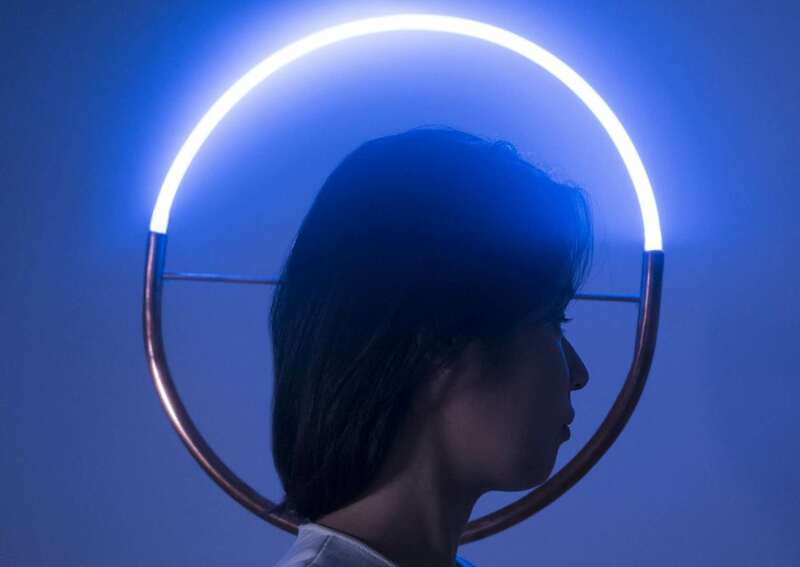 Rather than dolefully looking back and trying to replicate the high-point of crafts like bamboo weaving, porcelain pottery or neon light-making, the artists on show at Craft: The Reset are using their modern understanding of craft to refine the practice, bringing these aged formats with them into the present tense. During our visit, we encounter a wall of porcelain jars and bowls, designed by Julie & Jesse, and purposefully made to resemble the passage of time at Jingdezhen, China's capital of porcelain culture. Here we run headlong into the idea of gradual change, as these pots point to the shifting culture at that venerable city of ceramics. Their work begs the question as to how designers can halt the progress of time and the erosion of their materials. Meanwhile, Hangzhou-based studio PINWU bring their devoted study of materials and of Chinese design techniques to bear upon simple, but attractive works like ‘AIR Chair.’ This chair makes use of bamboo weaving to create a seat that resembles a safety net, a perforated, parabolic wooden piece that is art, craft and furniture. Made up of three designers, Zhang Lei, Christoph John and Jovanna Zhang, PINWU aim to catalogue Chinese crafts in their Rong Design Library in Hangzhou, while also using traditional crafts and materials to highlight China's long and illustrious history of design. British artist Michael Young, who is based in Hong Kong, references traditional Chinese pottery with his ‘Orzone Vase’ works. He creates cloisonne decorations on the vases’ surfaces by using 3D printers. This hi-tech solution allowed him to add the fine cloisonne lines, which resemble bubbles. His initial design for the vases was made on a computer five years ago, but after finding that the patterns were too complex to mold into the pots by hand, he eventually turning to 3D printing. While Young’s contributions to the future of craft come by making use of new technology to update the artform, other installations use their work to point towards a better future. We hear a snippet from Florian Wegenast, of London-based duo Florian & Christine, as he speaks to the ideas that went into their ‘Hong Kong Harbour: Future Sea Craft’ piece. They spent time studying crafts in Hong Kong and got in touch with Hong Kong-based neon master Wu Chi Kai. The duo used their work to shine a light on the under-documented plight of the neon industry, which once dominated every central street in ‘the Fragrant Harbor.’ For this piece, they also recycled materials such as sea glass and sea plastics from Victoria Harbor in order to address the pollution that wreaks havoc on the environmental life of the booming seaside city. When taken together, these works create a range of ideas for users to digest and, as such, the differences between ‘Craft Innovation’ and ‘Crafting for a Better World’ sometimes fall away. The exhibition as a whole leaves us with an idea of the care with which these pots, stools, neon lights and chairs have been crafted and we leave concerned, but excited, for the future of crafts. Putting these pieces in the context of a major manufacturing city such as Shenzhen seems to seek to implore people to step back from mass production for a moment in order to consider what we could be making if we only had the time to slow down.